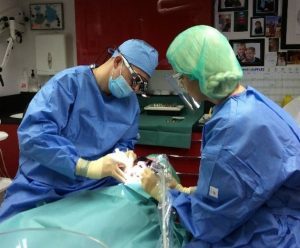 Ross graduated from Guy’s Hospital, London in 2000 and is a dentist with Special Interests in Implant Dentistry and Advanced Restorative Procedures. He has placed over 2,000 implants in the last 10 years. 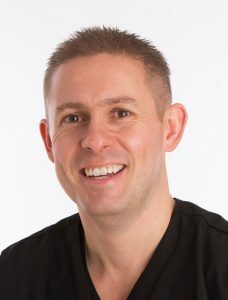 Ross began his Implant journey at the Morriston Hospital, Swansea and has subsequently attended extensive Higher Education across the UK, Europe and North America from the world leaders in Implant Dentistry. Ross has also been awarded the highly-regarded Diploma in Implant Dentistry from the Royal College of Surgeons, London – one of few to have gained this qualification. He works closely with the Straumann implant system – however he has extensive experience with many other implant systems – ensuring that he provides care scientifically proven to be long lasting for your patient’s best interests. He is a Fellow of the International Team for Implantology (ITI) – and a Study Club Director and clinical mentor for this Worldwide Organisation. He regularly holds implant courses and lectures nationwide on a variety of topics at different levels, however he has a particular interest in Aesthetic Implant Dentistry, Digital Dentistry and complex Bone Grafting procedures. Ross accepts referrals from colleagues for all levels of complicated treatments at both his Cirencester and Stow-on-the-Wold practices. As well as being a Fellow of the ITI, he is also a member of the Association of Dental Implantology (ADI) and the Royal College of Surgeons (RCS). His commitment to Cosmetic Dentistry maintains his Full Membership of the British Academy of Cosmetic Dentistry (BACD). To ensure his standards are of the highest possible, he regularly submits his work to scrutiny by his peers – often at national awards. Immediate contact to arrange your patient’s initial Implant Consultation as quickly as possible. Explanation of different payment options to allow your patient to select the method that best suits their individual needs, including 0% Finance #. Written communication with you, the referring dentist, to confirm and update you of your patient’s implant journey at every stage. 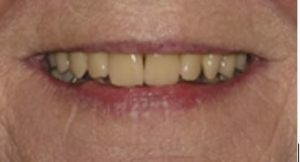 Unlike many other practices where patients may be referred off elsewhere for different elements of their Dental Implant treatment, at Cirencester Dental Implant Practice we are able to ensure all your patient’s treatment is conducted on-site. That means that everything from their Initial Consultation and CBCT Scans, through to the final restoration of their Implants, can be done in Cirencester without the need for your patient to travel elsewhere. # Subject to status. Typical 0% APR. Ross Glenn Cutts, trading as Cirencester Dental Practice and Stow-in-the-Wold Dental Practice, is authorised and regulated by the Financial Conduct Authority for the purposes of consumer credit, and recorded in the Register under reference no 734545.